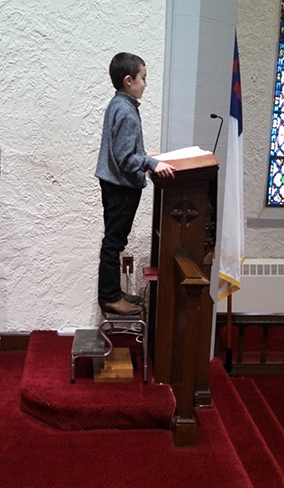 With the voice of an angel 10-year-old Randall Dean Forshey is Liturgist of the Month at Cambridge Ninth Street United Methodist Church (Southern Hills District). It gives the congregation the opportunity to remember that God’s calling to share His word comes in all sizes and ages. When not reading the Call to Worship or leading the congregation in the Unison Prayer, Forshey is busy helping in other ways. During Advent, he can be found lighting candles during service, helping the community nursery school children during their annual Chrismon program, and reading the Advent liturgy to more than 200 congregation members and visitors during the program. Each week Forshey joins in the activities and prayers of junior church with the other children. He and his brother Carter also enjoy the fellowship and activities at Between Times – a weekly youth program at Ninth Street UMC. He also serves as an usher during various worship service and participates in the Community Steeple walk in December. Pastor Karen Rawlins and several church members and visitors who have heard Forshey lead prayers say he touches their hearts and souls with his sincerity. Church activities are not all that keeps him busy in the community. Forshey shows his horse at the county fair in several events, takes dance classes at Dance Central and is a member of both the Tennessee Walker Youth Association and the Guernsey County Saddle Club 4-H groups. At home, he likes to play with his Matchbox cars and hang out with his brother. In the winter he likes to ride sleds and loves snow days off from school. When asked if he was nervous talking in front of so many people Forshey said, “Not now. 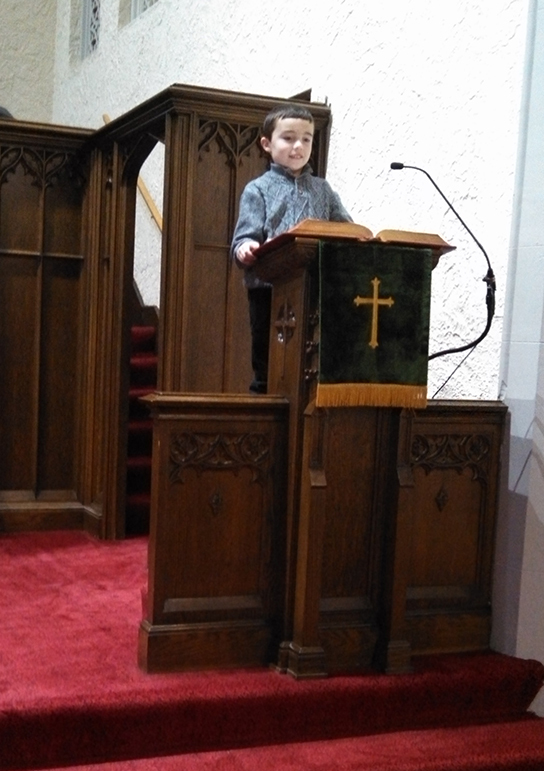 The first time I was but after that I wasn’t.” He was quick to give credit to his mentor when asked what made him think he wanted to be the liturgist for the month. “When Roger Seaton did it, he made it look really interesting and fun, and when I did it he helped me a Forshey said. Asked if he had plans for when he grew up, Forshey, who will be 11 years old in September, said he wants to be a car salesman – because he likes playing with his cars – or a realtor. He has been to a few open houses with his parents, and watches Property Brothers on HGTV with his mom. He thinks it looks like fun. His parents, Joe and Raylin Forshey, are very proud of him and believe he can do whatever he puts his mind to. *Caroline Johnson is in her 1st year as secretary of Cambridge Ninth Street United Methodist Church.